In 1986 it was still challenging to hear heavy metal on mainstream media. It would have been easier for Ghengis Khan to pass a CRB police check to help out at his local school than for the UK public to see or hear, say, AC/DC on the BBC. MTV was still virtually an Arthurian legend in England: America being a holy grail where you could watch 24 hour rock videos, hear Led Zeppelin on the radio on constant rotation. The BBC on the other hand tended to greet guitar-based music with all the enthusiasm of Rupert Murdoch greeting his Audit Committee. In the UK we had something else on constant rotation: the three-headed Cerburus-like beast of Stock, Aitken and Waterman. These self-styled pop-gurus thought they were creating the next Motown but what came out was more like Harlow New Town (no offence to Harlow). Their “Hit-Factory” starred Kylie, Jason Donovan, Rick Astley, Sonya, Pepsi and Shirley and relaunched the career of Bananarama. Thankfully, Jools Holland and Channel 4 had The Tube – a show that (like Later…. does now) rather sensibly played anything but S.A. and W. acts. And for one magical two or three hour episode, they had a Heavy Metal Special. Starring Ozzy (who I had never seen before), UFO and a band called Cherry Bombz all playing live, the show also featured interviews where Jools asked Ozzy to define what Heavy Metal was (to which Ozzy eloquently suggested “if your balls don’t shake, it’s not heavy metal”), and some video clips showing the development of the genre over time. Which gets me to the point of this post. Because in that series of clips, there was an old video clip of a vicar, dressed in a dog collar. He appeared to be giving a sermon. “In the beginning” he said “back in 1955 / Man didn’t know about rock and roll / and all that jive”. 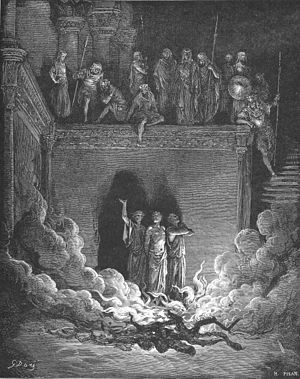 Roll over Shadrach, Meshach and Abednego, and tell Tchaikovsky the news…I bought an AC/DC album first thing next morning. Series 40 of Later…with Jools Holland begins on Tuesday 17th April 10pm BBC2 with Paul Weller and The Maccabees, amongst others. That’s a great interview! You were fortunate to meet the band so early in their careers. Very cool. Yeah…old school AC-DC is the best. Unfortunately I didn’t get to see them till ‘Back In Black’…I wore that record out though. To me, they went down-hill from there. I have the box-set called ‘Bonfire’…all old school. It’s awesome!